Summer is a great time of year for to get outside and enjoy life with your dog. However you want to make sure you keep your pet safe from common summertime health hazards. These summertime safety tips for dogs, will help to keep your pet safe. Pavement, concrete, and even grass can get extremely hot during the summer. We forget this because we are wearing shoes, but our dogs are not. Dog paw burns are very common and very preventable. Test the walking surface by placing the back of your hand on the ground for at least 5 seconds. 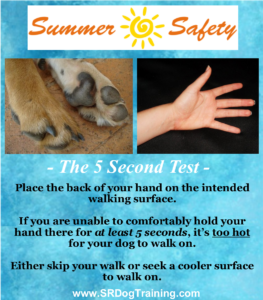 If you cannot comfortably hold your hand there, it is too hot to walk your dog on it. Try walking your dog in the early morning or evening hours. Grass and wet surfaces tend to be cooler options to walk on. Everyone’s pool is open for summer, but NOT all dogs can swim. Everyone knows never to leave children unsupervised around the pool, but not everyone knows the same rules apply for your dog. Teaching a dog to swim doesn’t mean they can just paddle around when you carry them in the pool, they MUST know how to safely enter/exit using the pool steps. This is essential, so they can safely get out if they ever accidentally fall in. Canine pool drownings are a big concern, but they are a very preventable disaster. 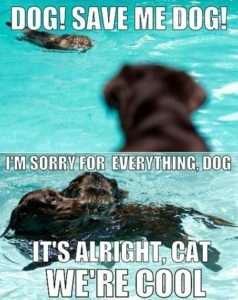 Never leave your dog unsupervised around the pool. Always be with them when in or around the pool, that way you and your dog can enjoy the summer together! We would never think about sticking our head out of a car window when driving 65 MPH down the road. We wouldn’t want to get rocks, dirt, and debris in our eyes. 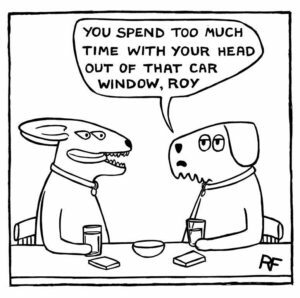 This is the exact reason why your dogs should not have their head out the window. Not only is possible eye damage a concern, but also ear damage. A dog’s ears are very sensitive, becoming irritated, swollen, and permanently damaged from flapping in the wind. Dogs can also unexpectedly jump or fall out of a cars window. It should also be quite obvious that dogs are never to ride in the back of a pickup truck. The bed of a pickup offers no protection for a dog who can easily fall out and/or get burnt paws from excessively hot truck bed liners. One possible option is to open the car window just an inch while driving. This allows your dog to take in the varying scents, while reducing the risks and hazards. Another major concern is to never leave your dog in a parked car. The internal temperature of a car will greatly exceed the outside temperature, even on a cool day. 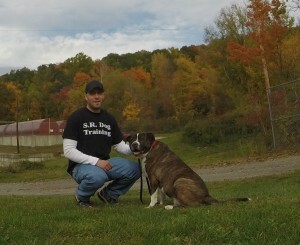 As a responsible dog owner, I know you are concerned for your dog’s safety. 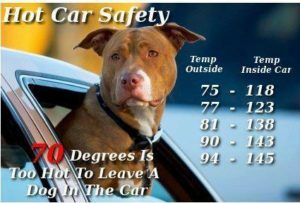 So don’t allow your dog to hang their head out the window when driving and never leave them alone in a parked car. More dogs go missing on July 4th than any other day of the year. That’s why it’s essential that you keep your dog in the house or on a leash with you when outside. Even if you have a fenced in yard, your dog can escape out of fear. Firework celebrations typically take place several days or weeks before/after the July 4th holiday. So it’s important you adhere to these safety precautions well-before and after our Independence Day celebration. Also use this as an opportunity to make sure your dog is microchipped, with microchip info up-to-date, and have your dog wear an appropriately sized collar with dog tags/contact info. Don’t let the microchip give you a false sense of security. Microchips are NOT GPS devices. A lost dog still needs to be tracked down and caught, in order for the chip to be read. It is much easier said than done, when it comes to tracking and catching a lost dog. Therefore, prevention is the best medicine – make sure to keep your dog safe this July 4th holiday. If your dog is scared of fireworks, thunderstorm or if you have a puppy who you want to condition to these sounds, check out my article and dog training sound effects playlist HERE. If you have not already read my article on how to protect your dog from bloat (the second largest killer of dogs), do so NOW. Click HERE to read and watch the video.